Habit: Herbage green. Stem: erect, 10--30 cm, stout. Leaf: basal 10--40 cm, persistent; cauline 2--3, generally reduced upward. Inflorescence: flowers 1--many, nodding. Flower: perianth spheric, closed at tip; sepals 20--30 mm, lanceolate to lance-ovate; petals 25--33 mm, narrowly ovate, light yellow, ciliate with thick hairs, sparsely hairy, nectary deep, bordered above by slender hairs; filaments 6--8 mm, dilated at base, anthers 3--5 mm, oblong, mucronate, yellow. Fruit: nodding, 20--30 mm, winged. Seed: irregular, dark brown. Chromosomes: 2n=20. Ecology: Wooded slopes, rarely chaparral, generally northern aspect; Elevation: 200--800 m. Bioregional Distribution: ne SnFrB (Mount Diablo, Contra Costa Co.). Flowering Time: Apr--Jun Note: Hybrids with Calochortus umbellatus rare. 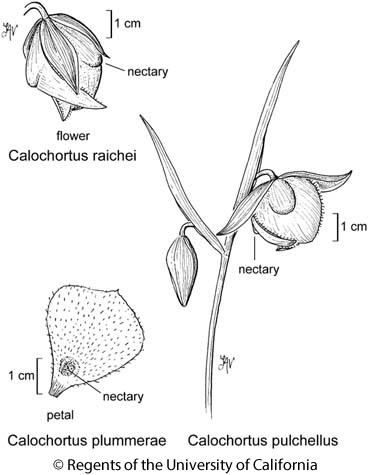 Citation for this treatment: Peggy L. Fiedler 2012, Calochortus pulchellus, in Jepson Flora Project (eds.) Jepson eFlora, http://ucjeps.berkeley.edu/eflora/eflora_display.php?tid=16755, accessed on April 22, 2019.
ne SnFrB (Mount Diablo, Contra Costa Co.). Markers link to CCH specimen records. Yellow markers indicate records that may provide evidence for eFlora range revision or may have georeferencing or identification issues. Purple markers indicate specimens collected from a garden, greenhouse, or other non-wild location.